General notes: For this 32nd annual special report, Med Ad News editors rank and profile the world’s top 50 companies that generate revenue from healthcare products. Companies that research, develop, manufacture, and sell healthcare products with a strong base in pharmaceuticals are eligible to be included in this special report. As defined by Med Ad News, healthcare products include human prescription and over-the-counter pharmaceuticals, generics, imaging agents, medical devices, medical equipment, medical/surgical supplies, diagnostics, and animal healthcare products. To be considered for the top 50 company list, companies must be independent and publicly traded (or make their financials public) and must have the capability to develop, manufacture, and market human prescription therapeutic drugs. Companies are ranked according to the name of the parent company. All companies are ranked in the main table by their worldwide 2017 healthcare revenue. This number was provided by the companies, unless otherwise noted. All other data in tables represent the group’s consolidated financial figures, unless otherwise stated. 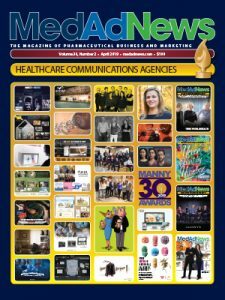 Two companies appear in this year’s Med Ad News top 50 listing that were not ranked in the magazine’s October 2017 annual report: H. Lundbeck at No. 48 and Ono Pharmaceutical at No. 49. Thirty-seven of the top 50 companies reported financials with a Dec. 31, 2017, year-end. Mallinckrodt’s fiscal year as of 2016 previously ended on the last Friday of September; as of 2017, the company’s fiscal year now ends on the last Friday in December (Dec. 29, 2017). These 10 companies reported financials with a March 31, 2018, fiscal year-end: Astellas Pharma, Daiichi Sankyo, Eisai, Mitsubishi Tanabe Pharma, Ono Pharmaceutical, Shionogi, Sumitomo Dainippon Pharma, Sun Pharmaceutical Industries, Taisho Pharmaceutical Holdings, and Takeda Pharmaceutical. Aspen Pharmacare Holdings and CSL reported financials with a June 30, 2018, fiscal year-end. Revenue: In tables that rank by revenue, each company is positioned according to worldwide revenue – either by healthcare or consolidated group, depending on the chart. The revenue figures include net sales of healthcare products, and potentially interest, dividends, and other income when provided. Sales from discontinued operations have been included when applicable. Earnings: This number represents the net income figure that appears in the income statement, after taxes and after nonrecurring and extraordinary charges. The net income figure is based on the consolidated sales of the group. Figures appearing in parentheses indicate a loss. Earnings per share: The number for earnings per common share is taken directly from company financial statements. This figure, based on consolidated results of the group, is adjusted for stock splits and stock dividends. Med Ad News editors used the diluted earnings per share figure when provided. Figures appearing in parentheses indicate a loss. Research and development: In the chart that ranks each top 50 company according to the research and development expenditure of healthcare products, the numbers were provided by the companies. Also provided is each company’s total R&D expenditure (consolidated) for all businesses. For some of the Japanese companies, the healthcare R&D was not provided and thus the consolidated figure was used in its place; in these instances, the difference between the healthcare and consolidated R&D totals was not a large amount. Total assets: This number represents the company’s year-end total assets as reported in the company’s balance sheet statement, and is for the group. Shareholders’ equity: This number represents total shareholders’ equity at year-end as reported in the company’s balance sheet statement, and is for the group. Employees: This number represents the total number of employees for the year. Market capitalization: The information that appears in this chart shows the market capitalization of companies. The information came from Yahoo! Finance, Google Finance, and other sources and reflects company market capitalization as recently as Oct. 1, 2018. Exchange rates: For non-U.S. companies reporting in foreign currency, Med Ad News editors used exchange rates to convert income statement and balance sheet figures to U.S. dollars. The conversions have been made for the purpose of convenience and comparison only. Med Ad News editors used average exchange rates to calculate income statement figures and balance statement figures. The exchange rates are based on data made available by the U.S. Federal Reserve Board (federalreserve.gov) and certain company documents. Unless otherwise indicated, the editors used the average 2017 exchange rates. So that the percent change in financial statement and balance sheet information reflects the actual increase or decrease in the company’s home-country currency, the editors used a constant rate of exchange for 2017 and 2016. This reflects the increase or decrease actually reported by the non-U.S. company. The same exchange rate was used for the income statement and the balance sheet figures. For the companies that report in euros, Med Ad News translated U.S. dollar amounts from euros at the rate of €1.00 to $1.1301, the average rate of exchange in 2017. The top 50 companies that reported in euros were: Bayer, Boehringer Ingelheim, Grifols, Merck KGaA, Sanofi, Stada, and UCB. For the companies that report in yen, Med Ad News translated U.S. dollar amounts from yen at the March 2018 rate of ¥106.0468 to $1.00, except for Chugai, Kyowa Hakko Kirin and Otsuka, whose numbers were translated at the 2017 average rate of ¥112.10 to $1.00. The top 50 companies that reported in yen were: Astellas, Chugai, Daiichi Sankyo, Eisai, Kyowa Hakko Kirin, Mitsubishi Tanabe, Ono, Otsuka, Shionogi, Sumitomo Dainippon, Taisho, and Takeda. For the company that reports in pounds sterling, Med Ad News translated U.S. dollar amounts from pounds sterling at the rate of £1.00 to $1.289, the average rate of exchange in 2017. The top 50 company that reported in pounds sterling was GlaxoSmithKline. For the company that reports in Swiss francs, Med Ad News translated U.S. dollar amounts from Swiss francs at the rate of SFr0.9842 to $1.00, the average rate of exchange in 2017. The top 50 company that reported in Swiss francs was Roche. For the companies that report in Danish kroner, Med Ad News translated U.S. dollar amounts from the kroner at the rate of DKr6.5957 to $1.00, the average rate of exchange in 2017. The top 50 companies that reported in Danish kroner were Lundbeck and Novo Nordisk. For the company that reports in Indian rupees, Med Ad News translated U.S. dollar amounts from the rupee at the March 2018 rate of Rs65.0455 to $1.00. The top 50 company that reported in Indian rupees was Sun. For the company that reports in South African rand, Med Ad News translated U.S. dollar amounts from the rand at the June 2018 rate of R13.3138 to $1.00. The top 50 company that reported in South African rand was Aspen.